GitHub - radumg/DynaWeb: DynaWeb is a Dynamo package providing support for interaction with the interwebz in general and with REST APIs in particular. Want to be notified of new releases in radumg/DynaWeb? everything in between (PUT, DELETE, PATCH, etc). the package also includes some rather nifty JSON de/serialisation nodes, so you can use the information you get from the web directly in Dynamo graphs, as native types. DynaWeb was designed as a package to make other packages, so it provides building blocks enabling you to build Dynamo integrations with just about any web service out there. After making DynaSlack & DynAsana, it became clear that writing a ZeroTouch-based package for every web service I or the community would want to integrate with was simply not scalable or sustainable, no matter how much code was re-used. DynAsana is an abstracted DynaSlack and DynaWeb is an even more abstracted & modularised DynAsana. DynaWeb is now available on the Dynamo package manager, search for DynaWeb and install it from there. See Alternative installation methods at the end of this document for alternative install methods. This repository has quite a few sample files provided to help you get started with DynaWeb. I highly recommed starting with the samples as they contain detailed notes and instructions on how to use each of the nodes. Feel free to open an issue or submit a PR if you'd like to see further some documentation added here. There are 8 sample Dynamo graphs included with the package, provided in both Dynamo 1.3 XML file format and Dynamo 2.0's new JSON format. You can find the samples in this repository's samples folder folder, as well as and in the extra folder of the package you download using the Dynamo Package Manager, typically found here : %appdata%\Dynamo\Dynamo Revit\1.3\packages\DynaWeb (note version and Revit flavour of Dynamo, your location may vary). 3 nodes, similar to out-of-the-box (OOTB) Dynamo experience today. Introduces the 3 stages of performing web requests and explains quite a few things. Also show how to achieve same thing with the OOTB node. Same as sample 2 but with added nodes that provide more information about the request (timing, etc) and output the results to text files. This introduces the use of the WebClient class and some of the basic priciples of interacting with REST services. Uses a REST API that is freely accessible and returns JSON reponses. Contrasts using a WebClient and a WebRequest to achieve same thing and also introduces Deserialisation. Introduces POST-ing to a REST API service and handling JSON payloads. Once the request is submitted, the response is deserialised too. Further expands on the above example, building a complex WebRequest with 6 steps before its execution. This example builds a WebRequest and attaches a file to it, to upload directly to the Autodesk Forge service. See the issue that sparked this sample here. This example builds a POST WebRequest, used to request an authorisation token from the Autodesk Forge service. See the issue that sparked this sample here. Execution : this provides nodes that simply execute requests, making it easier & clearer to use standard http verbs such as GET, POST, etc. Helpers : a few helper nodes, with a particular focus on Deserialisation. If you prefer to install one of the more experimental/work-in-progress builds, you can still follow the instructions below. start Dynamo, the package should now be listed as DynWWW in the library. 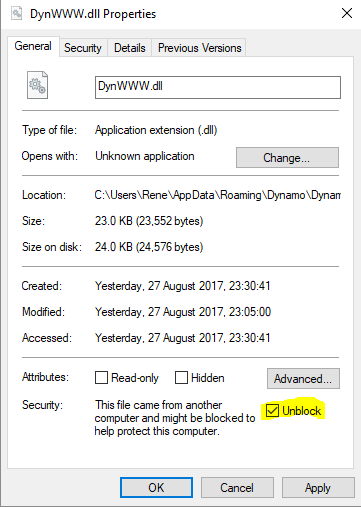 Still can't see the package in Dynamo ? Tick the Unblock checkbox at the bottom, in the Security section. Launch Dynamo again, the package should now load. Updating from alpha-0.5 build ? Please note the project has no dependency to Revit and its APIs, so it will happily run in Dynamo Sandbox or Dynamo Studio. Please read CONTRIBUTING.md for details on how to contribute to this package. Please also read the CODE OF CONDUCT.md. This project is licensed under the GNU AGPL 3.0 License - see the LICENSE FILE for details.